The Briolette of India is a legendary diamond of 90.38 carats, which, if the fables about it are true, may be the oldest diamond on record, perhaps older than the Koh-I-Noor Diamond. In the 12th century, Eleanor of Aquitaine, the first Queen of France and later England, brought the stone to England. Her son, Richard the Lionhearted, is said to have taken it on the Third Crusade. It next appeared in the 16th century when Henry II of France gave it to his blonde mistress, Diane de Poitiers. It was shown in one of many portraits of her while at Fontainebleau. 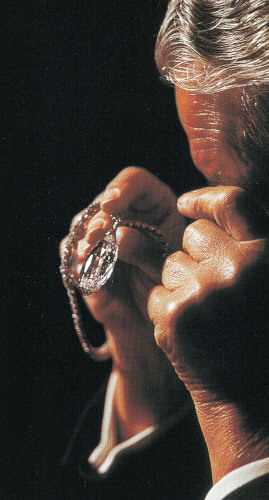 Harry Winston examining the Briolette of India with a jeweler's loupe. After disappearing for four centuries, the stone surfaced again in 1950 when the jeweler, Harry Winston, of New York, bought it from an Indian Maharajah. It was sold to Mrs. I.W. Killam and bought back by Mr. Winston, following her death, about 10 years later. 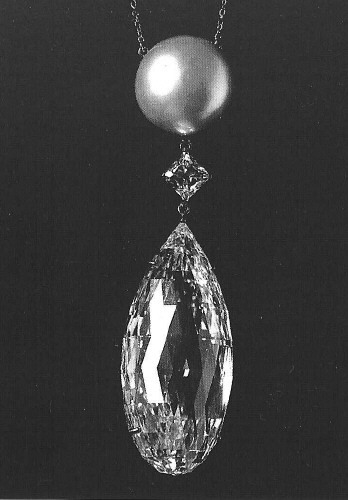 The Briolette of India set in a necklace with a diamond and a large pearl. The book Diamonds - Famous, Notable and Unique was published in 1974, since that time new information on the Briolette of India has surfaced. The gem was thought to have a history extending to the Middle Ages, unfortunately recent research has revealed it was cut in Paris in 1908-9. Nevertheless, the gem is very unique and remains the most famous briolette-cut diamond in the world.